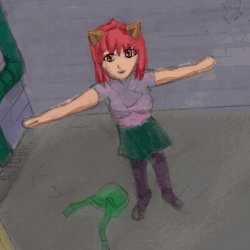 This is an early paint sketch of a larger scene featuring Lucy from Elfen Lied as the main focus of a scene I dreamt up a few weeks ago. A sketch of the scene was done on A4 paper with the help of pencil and ruler to put my hand towards a perspective view of an industrial setting by a beach. The above focal point has loose details associated with Lucy, at this time its a placer image - detailing the eyes and hair. The image differs vastly from the Flash/vector version of Lucy/Nyuu that appears on this site. Instead of fine lines and fills, this was painted using my graphics tablet and pen using software. Slowly I intend to build up the image and post work-in-progress step/stages to show progression.